The Lockheed Martin C-130 Hercules reaches another major milestone on August 23 marking the 60th anniversary of its first flight at Burbank, California, in 1954. To honor this historic C-130 anniversary, Lockheed Martin invites members of the worldwide Hercules community to share their C-130 memories, experiences, photos and videos. From Aug. 18 through Sept. 30, stories can be shared through Facebook, Twitter, Instagram, Flickr, LinkedIn, Google+ and YouTube. Stories will be collected on a Lockheed Martin-sponsored website and shared with page viewers. To ensure stories are included on this site, the hashtag “#herc60” must be included within each post. Submissions also can be emailed to c-130-communications.gr-aero@lmco.com and they will be manually posted on the anniversary site. In addition, special videos, photos and features saluting the C-130 will be posted daily to Lockheed Martin’s corporate webpage, Code One Magazine, Facebook, Twitter, Instagram, Flickr, LinkedIn, Google+ and YouTube accounts throughout the week of Aug. 18-23. Since its debut, the C-130 Hercules has exhibited a combination of rugged tenacity, unmatched flexibility and continuous innovation that continue to make it the global airlifter choice. The C-130 has the longest, continuous military aircraft production run in history and is one of the top three longest, continuous aircraft production lines of any type. The aircraft is widely considered as the world’s most proven workhorse. To date, more than 2,500 C-130s have been ordered and/or delivered to 63 nations. The C-130 operates out of 70 countries and has been produced in more than 70 variants. All of the C-130’s production models have been built at the Lockheed Martin Aeronautics Marietta facility. The Hercules has been everywhere and is known for its ability to tackle any mission, anywhere, at any time. Aircrews have flown it to both poles, landed or airdropped military supplies to combat hot spots and performed countless relief operations around the globe. From the highest air strips in the Himalayas to landing on an aircraft carrier in the middle of the ocean, the C-130 regularly – and proudly – defies expectations. Copyright Photo: Bruce Drum/AirlinersGallery.com. The C-130 is mainly a military transport aircraft. However several airlines have operated the civilian version. Of course the civilian version, the current Lockheed 382G (L-100-30), remains a viable and tough airline transport to this day in many remote parts of the world. Even passenger carriers like Delta Air Lines have operated the Hercules on dedicated cargo routes. An earlier model, the pictured Lockheed 382E-6C Hercules (L-100-20) N9259R (msn 4176), is seen at the Atlanta base on October 3, 1969. This aircraft was delivered on October 14, 1966. 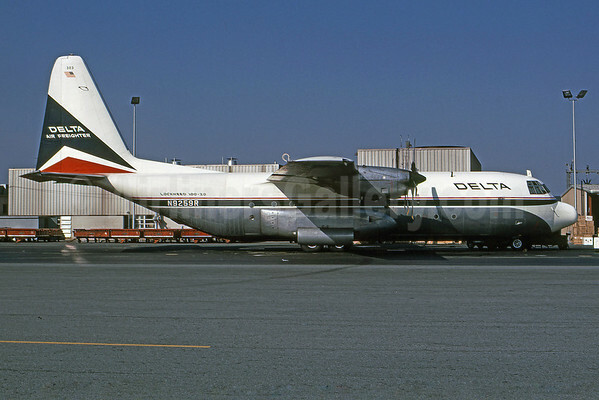 Delta replaced its Curtiss C-46 freighters with this newer turboprop freighter. The dedicated freighter service was short-lived. This entry was posted in Delta Air Lines and tagged 382, 382E, 382E-6C, 4176, ATL, Atlanta, C-130, C-130 Hercules, Delta Air Lines, Hercules, L-382, Lockheed, Lockheed 382E Hercules, Lockheed C-130 Hercules, Lockheed Martin, N9259R on August 19, 2014 by Bruce Drum.